This week marks 100 years since the first women got the vote, so there’s no better time to post about equality really is there? There’s some great articles online, especially on Stylist. I stumbled across this book on a small book stand at this year’s Wired Live (you know how much I love this event), having read the blurb I was instantly like “omg I literally need this book, it’s all my fears about being a working women in one“. Naturally the book stall owner encouraged me to buy it, explaining that there was only two copies available in the UK as it wasn’t out until the end of December (it was early Nov). The following day having seen Sarah speak at the event, I tweeted her, we met up and she signed it – I was SO happy, she’s my new found hero. 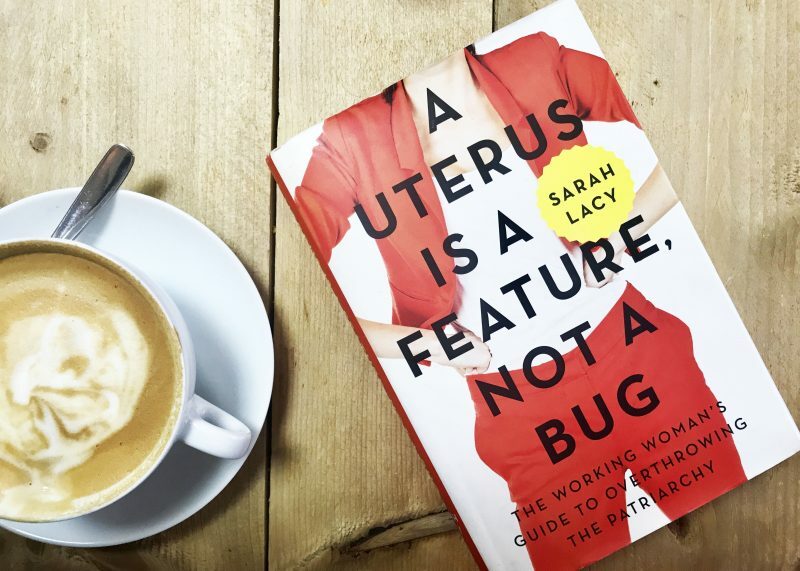 In the book, “A uterus is a feature not a bug”, Sarah Lacy challenges the rumour that women can’t be both a great mother AND a great employee. Research, Lacy’s own experiences and opinions from women across the world have been woven into a story analysing and tackling some of the toughest situations in today’s working world. Sarah Lacy is an American journalist and author who has spent her career covering the technology industry, and notably exposed Uber for sexist behaviour in their handling of a number of high profile disputes. According to a study, which Lacy references throughout the book, 40% of American’s think that women shouldn’t work (seriously what on earth?!). How is it possible that there is a large proportion of people who seriously believe women shouldn’t be working at all. It’s 2018, the fact that anyone can be that backwards today is beyond me. Although saying this, a lot of things have shocked us all recently so perhaps I should be less surprised. What I loved about this book is the frank, clear cut anaylsis of situations – Lacy herself admits to trying to “fit in” as “one of guys” earlier in her career, as do other successful females in Silicon Valley. Her opinion on her own previous behaviour dramatically changes after she becomes pregnant, isn’t honoured a senior job at her workplace and then decides to start an organisation of her own, all in a very short timeframe. Lacy draws on her own experiences in Silicon Valley and has spent a lot of time speaking with other females in the industry. She interviews women in Iceland, who have been paving the way for the rest of the world when it comes equality. She builds relationships with many successful Chinese CEOs, founders and businesswomen who have actually benefitted hugely from the one child policy and some of the huge cultural differences in China. Throughout the book, in her pursuit of equality, Lacy argues that by giving women the ability to be great employees and great mothers, not only will mothers and families benefits, but organisations will too. I am often in awe of mothers I know and work with (shout out to all working mums 🙋🏼 ) , they fit an extradordinary amount into a day and I too want to have the confidence that it’s possible I can do that too. If you’re looking for a modern day guide on what equality really means into today’s incredibly crazy world – this is for you! You can buy Lacy’s book on amazon, and follow her on twitter for the latest technology news from her publication, Pando Daily. Next Post Where to eat in Southwark?